UPDATE: We have our winner! Congratulations, Kellie Rose Wilson. Please check your email on how to claim your prize. Thanks to everyone who entered! Celebrities always seem to have picture perfect hair, even when they’re running errands. It’s a little unfair. But, there’s hope for us non-famous girls out there. The Sultra Bombshell Curling Iron makes it delightfully easy to curl and wave hair in mere minutes. Plus the iron is clipless, so you don’t get that awkward "clip kink" in your hair. Just stunning, gorgeous curls. 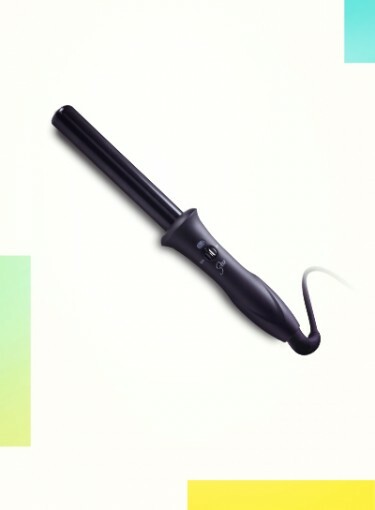 The Prize: One winner will win a Sultra Bombshell 1-inch Curling Iron. The Deadline: The contest will run from Monday, August 6th to Friday, August 10th. We will pick the winner at 12 p.m. on Friday, August 10th. Good luck! US only; contest not valid for previous giveaway/caption winners.